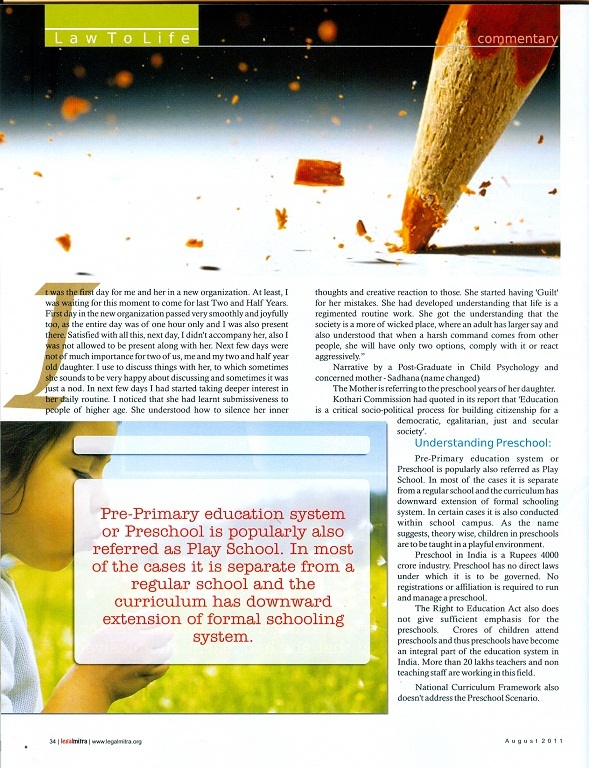 – Article by Abhidha Seth on Preschool and School scenario in India. The Mother is referring to the preschool years of her daughter. Kothari Commission had quoted in its report that ‘Education is a critical socio-political process for building citizenship for a democratic, egalitarian, just and secular society’. Pre-Primary education system or Preschool is popularly also referred as Play School. In most of the cases it is separate from a regular school and the curriculum has downward extension of formal schooling system. In certain cases it is also conducted within school campus. As the name suggests, theory wise, children in preschools are to be taught in a playful environment. Preschool in India is a Rupees 4000 crore industry. Preschool has no direct laws under which it is to be governed. No registrations or affiliation is required to run and manage a preschool. The Right to Education Act also does not give sufficient emphasis for the preschools. 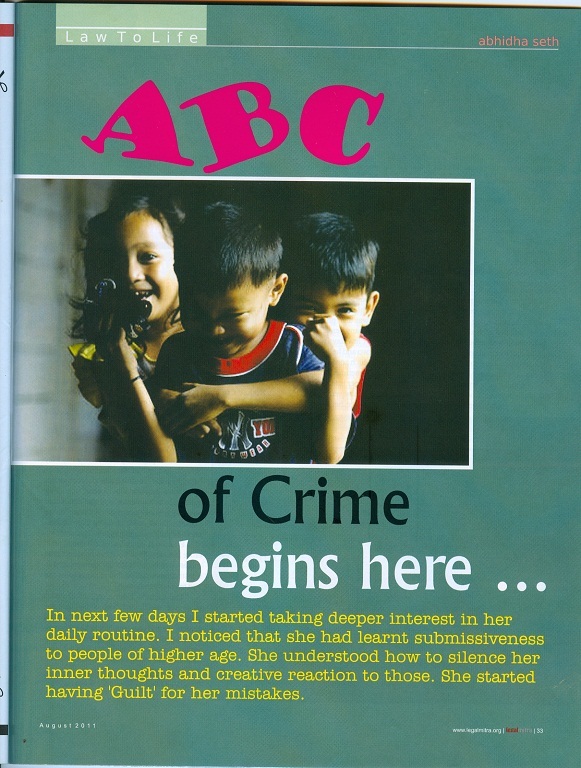 Crores of children attend preschools and thus preschools have become an integral part of the education system in India. More than 20 lakhs teachers and non teaching staff are working in this field. National Curriculum Framework also doesn’t address the Preschool Scenario. Preschools in India have taken their roots from being a downward extension of Schools, so here it has become imperative to see whether everything is right with Schools. Education in India is the Government’s responsibility and there are three formats of schools, Aided schools, Government schools and Private schools. Preschools are being run as a different identity from these, this is right as well. And, there is no Government Preschools. Presently schools are required to have affiliation from recognized Boards of Education, be it State Boards, Central Boards or other recognized private Boards of Education. Rules of affiliation are centered primarily towards Land and Buildings. Sadly, bricks, land don’t seem to contribute into education. Regarding training of teachers, affiliation laws requires Tecahers to be B.Eds. The B.Ed. program itself is a great misnomer, as program is designed poorly and in no way relevant in present ever changing social and educational scenario. Besides, social fact of India is that only those who are not able to progress any further in their career pursue B.Ed and most of the B.Ed awarding institutions are in remote area but fulfills the eligibility requirement as again it is heavily tilting to the requirement of land area. Basically the whole idea of Right to Education fails if the ‘education’ is not delivered or poorly delivered or criminally delivered or delivered in such a format that learners are more drifted away from education rather than coming near to it. Firstly, it has to be understood that ‘Right to education Act’ don’t covers the delivery of quality education in full sense. Second, it also fails to cover that how schools of equitable quality shall be made. Third, it also does not focus on the achievement of relevant learning outcomes via pedagogical support, teaching aids, curriculum and other such mechanisms. Most of School and Preschool related aspects could be monitored and controlled through the adoption of suitable legislative measures and proper government interventions. Separate laws shall be made to cover the entire aspects of Preschool and School Education like Affiliation, Curriculum, Pedagogy, Teacher Training, Teacher and Staff Salary, behavioural aspects of adults and children involved. Such laws shall also cover Child Rights pertaining to School and Preschool education. Law should also contain the concept of Ombudsman. School and Preschool Education Laws shall also enlist Legal and Social requirements to be met by all stakeholders. This Law shall also address the role of parents in changing School and Preschool scenario. Neighbourhood School (Pre-primary and Primary Division) concept shall be included in affiliation as well as all such processes of establishing a school and shall also be encouraged properly. Introduction of ‘Neighbourhood School Concept’ might also require making changes in law relating to Land usage, Residential Society by Laws and others. Although, no Laws, Legislations, regulations, government interventions, early childhood training, or inspections can make a Teacher to love and respect the pupil (child), these can surely create the feasible environment to make some positive change.